Creativity, Innovation, & Entrepreneurship: Another father/son innovation team? There's news out about another Father and Son team creating breakthroughs; this time the innovation is treating viruses using lasers. If you've been following my blog, you'll note that not long ago, I posted about the father and son team who are working on a lunar lander in the $2 million X Prize challenge. So, what is it about these father and son teams that create these breakthoughs? No doubt, each of these two dyads are composed of very bright individuals. I would also guess that each of the father-son combos share similar interests, but not exactly similar skillsets. Tsen and his son Shaw-Wei Tsen, a pathology student at Johns Hopkins University, came up with the idea while strolling in the park and discussing the need for antiviral treatments that go beyond vaccinations. 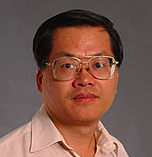 Tsen senior has long experimented with ultrashort-pulse lasers (USPs), devices increasingly used outside of physics. My guess is that the real conversation went something like this. son: So, dad, I've got this midterm coming up wherein I'll be asked to describe all the various ways to destroy viruses. dad: Well, son, I don't know anything about that there stuff. What are the different ways to destroy viruses? All I know about is how to destroy stuff with lasers. Sorry, I can't be much help to you. son: Dad, what can your lasers destroy? dad: Oh, lots of stuff sonny-boy. The joining of two seemingly-unrelated topics--physics and pathology--is the start of something wonderful. All it takes is for a little sharing, a little brainpower, and mixed with a little game of "What if...?"